Welcome to The Forza Athletics Life & Coaching Podcast! The purpose of this podcast will be to share my thoughts and experiences about coaching high school, collegiate, and post-collegiate throwers. I’ll be discussing research based ideas as well as my personal thoughts about various topics, including but not limited to coaching, routines, rituals, coach/life balance, motivation, preparation, and self-efficacy. 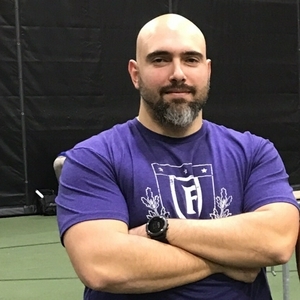 I had the honor to spend some time discussing throwing, training, and the work/life balance with Highland Games Professional Thrower Matt Hand. Matt has been involved with the Highland Games for over 15 years. In this episode he discusses how he got into throwing, training at two different colleges, making the transition to the Highland Games, turning pro, competing around the world, while balancing everything will a full-time job. Matt lives in Corning, NY, and offers coaching and clinics throughout the year. You can contact Matt directly through social media on Twitter and Instagram @MattHandThrows. Even though I've known Matt for a very long time, I learned some new things today about him, how he plans his programming, and what he 5-15 year plan is for growing the Highland Games. I had the great pleasure and honor to spend some time speaking with Sean Foulkes. He is an amazing throwing coach at Portage Northern High School located in Michigan. In his brief time there, he has coached a multitude of great shot-put, discus, hammer, and weight throwers. In this episode we spend some time discussing how he got into coaching, what it's like to coach 30-40 throwers in one session, bringing kids together, culture, buy-in, and his coaching philosophy. I learned a lot from Sean. I know you will as well! I had the opportunity to speak to student-athletes at SUNY Fredonia on Sunday, February 17th. During my presentation, one of the students asked me a question about how I had got to where I was in my professional life. I thought for a moment, and it ultimately came down to one decision I made while I was in graduate school. I received a phone call while I was working from our then current athletic director at SUNY Fredonia. The decision I made on the phone with him has led me to where I am today. Be sure to listen and find out what that decision was. Everyone once in awhile I'll get asked by another coach how we 'do' things at Nazareth College. Up until a couple of years ago, I never gave that much thought. Unfortunately, I didn't realize the importance of having a strong team culture was until we didn't have one. Looking for a fresh start with my group of throwers this season, I wrote them all a letter in July. In that letter, I asked them to think about three things: 1. What their expectations of themselves were going to be for the season 2. What their expectations of me as their coach were, and; 3. What their expectations of their teammates were going to be Those three questions helped establish our team's culture. Take a listen as I go into much more detail about our three questions and how they have helped shape the group of throwers we have at Nazareth College. In this episode of the Forza Athletics Life & Coaching podcast I share my thoughts of what our throwers expect to learn and be able to do by our first meet in December. At practice yesterday I asked each thrower to share their thoughts about what they hope to be able to do by our first meet, which is on December 6th. Not one thrower made reference to a specific distance they wanted to throw. This is a proud coach moment for me because in the past athletes would solely focus on outcomes, rather than process. A common theme that my throwers shared was about developing a pre-meet routine that would help them stay more focused and in the moment. I share some tips that I shared with my throwers yesterday. Deliberate Practice-What Does it Really Mean? In this episode, I discuss deliberate practice. You may have heard the term in the past, but do you really know what it means? In her book Grit, Angela Duckworth goes into great detail sharing her research about the topic and how it can be applied to pretty much any endeavor you wish to get more proficient in. The cycle of deliberate practice has four steps. They are: 1. Set a goal 2. Put forth 100% focus on that goal 3. Get feedback from your coach, and; 4. Implement that feedback until you reach your goal It sounds pretty simple, but how often do we as coaches give our athletes 101 cues or things to focus on during a throw? I've been guilty of that in the past as well. What Angela's research suggests is that focusing on one thing at a time will help us achieve our goals sooner and more efficiently. It is important for coaches and athletes to spend time and discuss individual goals, specific things to focus on during practice, and how we can become more efficient throwers. Spending time on one aspect of the throw at a time will help us get there faster than worrying about 10 facets of the throw at a time. In episode 22 of the Forza Athletics Life and Coaching Podcast I review the 4 yearly expectations I discuss with my collegiate throwers to ensure us the best possible opportunity to have a safe, successful, and rewarding season. The 4 expectations I review with my throwers on a daily/weekly basis are: 1. Everyone will give their best effort everyday 2. We will support each other throughout the season 3. Hold yourself and your teammates accountable, and; 4. Always represent yourself and Nazareth College with respect and dignity (Do what is right, avoid what is wrong – Lou Holtz) As a whole track & field program at Nazareth, we have 9 team expectations that we discuss with all of our athletes at the beginning of the season. We revert back to our team expectations if as a coaching staff we feel someone is not meeting them. I focus on the 4 above because I feel those are the one's that have the most direct relationship with throwing. In this episode of the Forza Athletics Life and Coaching Podcast I discuss a few ways coaches can better involve athletes in the yearly goal-setting process. Engagement is paramount. As coaches, we need to be able to engage our athletes, especially in long track & field seasons. It's important for us to engage our athletes as best we can to give them ownership in the yearly process. In this episode of our podcast, I review the contents of my latest book release-Thrower: Propelling Towards Greatness. My intention behind this book is to help coaches and athletes bridge the gap between goals, accountability, and expectations. For coaches, this book will assist you in creating a culture and environment that will provide your athletes the best opportunity to be successful. You will be able to better communicate and engage your athletes in devising plans that will propel them towards realizing their vision(s). Athletes, this book will help you be more accountable to your commitments and vision. Everyone wants to throw far, but what are you willing to do and sacrifice in order to reach your goals. This book will act as a guide that you will be able to follow throughout this season, and be able to reflect back on in the future. I provide a recap of the: 1. Introduction 2. 7 Traits and Activities 3. Practice Log, and; 4. Competition Journey You can purchase a copy of Thrower by visiting www.forzathletics.com. On our latest episode, I introduce the first trait that the best of the best throwers possess - a vision. They have a vision and plan set out for themselves. In some instances, the vision may be to accomplish a shorter-term goal, like qualify for a conference championship. For others, however, the vision may be to one day become a national champion. When we are able to see see or visualize where we want to be in one, five, or ten years, we are then able to define our commitments and how we will hold ourselves accountable to achieving that goal and realizing our vision. A vision without a plan to get there is still just a vision. Over the course of the next few weeks I'm going to spend more time discussing my thoughts about what it takes to be a great thrower. I'm going to be speaking from my experiences as a coach and what I've learned from Olympic throwers, their coaches, and their support systems. In this episode I ask the question, what makes great throwers? As with any new season, coaches and athletes alike are filled with hope, new goals, and expectations. In this episode I discuss how coaches and athletes need to hold each other accountable to their expectations. In this brief episode, I speak about the notion of cultivating athletes at the collegiate level. When selecting a college to attend, one of the topics worth looking into would be how much better do athletes get while enrolled at that college. Are coaches developing athletes and making them considerably better, or are they maintaining those athletes? Winning vs. Goal-Achievement-What is Important to You?